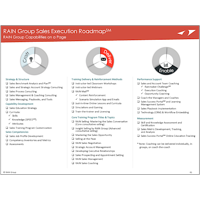 Download RAIN Group's Sales Execution Roadmap for a snapshot of our capabilities on 1 page. You'll learn how we approach building an effective sales force through our Craft, Deliver, and Enable process. Craft Powerful Training: Much of the success you have with sales training is determined before you even begin. We set the table for success and ensure that you’re teaching the right people the right things to achieve your specific goals. Customize Delivery for the Greatest Impact: We deliver effective training built for adult learners. We customize training programs and tools based on your industry, markets, goals, and the skills your team needs to develop for the greatest success. Enable Sellers to Succeed: From ongoing reinforcement to sales playbook development to coaching, we make sure training sticks, behaviors change, and learning gets applied on-the-job. Our education system delivers 94% engagement. Fill out the form to the right to download RAIN Group's Sales Execution Roadmap.